The dress. She was a real flapper. Love you Lisa. Mar and I threw ourselves a blow-out graduation party at our apartment in Muncie. Family, friends, faculty all came together and had a really great time. My understanding is that Jack and Mar got this exquisite antique beaded dress from some sort of estate settlement, but the top of it had become too fragile to hold the weight of all the beads. As a graduation surprise to Marian, Aunt Dolly had a new satin top made for the dress so that Mar could wear it. When she opened it at the party, everyone wanted to try it on. And they did!! Everyone who could fit into it (including her mom, Claire!). 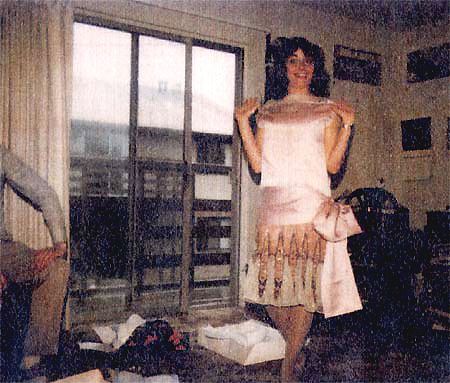 This shot was taken in our apartment at the party, 1985. It is an honor to be the keeper of this fabulous frock. Thank you.